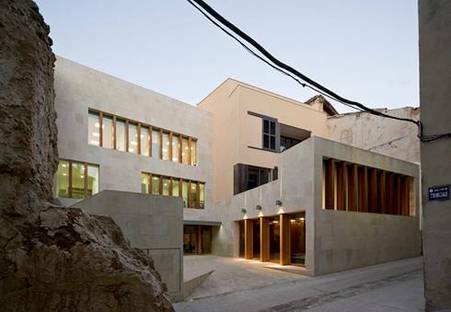 The Casa Julve school of music is located in the historical centre of Alcañiz; architecture practice, Magén Arquitectos was in charge of renovations, which have retained a balance between the old building and its new use. Spanish architecture practice, Magén Arquitectos is responsible for the painstaking, subtle renovation of Casa Julve, an old villa in the city centre of Alcañiz. The architectural solutions adopted are all aimed at renovating the building with respect for the historical centre. A quick glance at the renovated building does not immediately reveal its new use as a school of music – you have to stop and stare to see the changes. The client wanted to keep the original volume as it was and to create ties to the city by adding a new entrance at the rear of the building, which houses the cafeteria. The façade on this side of the building is more contemporary, although the lines of windows broken up by thin wooden battens are a reference to the cadence of the historical context. The interior architecture compresses the available space, while the new stairways and atriums allow light to flow into the rooms and traditional materials like local stone and hardwearing Iroko wood are used for the wall and floor coverings. This is an example of renovation at its best, where the new does not attempt to outdo the old but is a community service that really takes into consideration its context.